Blogs, News, and Events / Blogs / If You Build It and It’s Not Mandatory, Will They Come? I’ve been working with a client this week who is seeking to develop a training program for an audience that is in no way required to participate in the program. I’m not going to get into the details of the client: Let’s just say that they manufacture luxury widgets, and they distribute these widgets through a nationwide network of independent widget retailers. The client wants to develop a training program for the sales associates and store managers at the independent retailers; but, because the sales associates are not employees of the widget company (they work for the independent retailers), there is nothing that requires them to take the training. 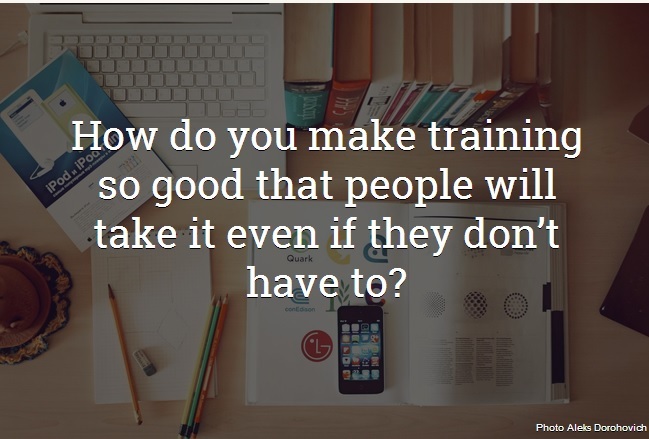 Which begs the question: How do you make training so good that people will take it even if they don’t have to? Develop and deploy a comprehensive marketing and communications plan for your training program. If you’re trying to get an audience to engage in training that their job does not mandate that they take, a communications plan is key. The “what’s in it for me” (WIIFM) argument has to be overwhelmingly strong. A key part of the communications strategy is engaging the right stakeholders. In this situation, there are a lot of people standing in between our widget manufacturers and our widget sellers — including stakeholders in distribution channels, store owners, and store managers to name a few. If these parties aren’t sold on the idea of the training, it’s never going to get to the intended audience — those folks actually selling the widgets to consumers like you and me. Bottom line: Engage your stakeholders early on, and develop a clear and comprehensive marketing and communications plan that gets at the WIIFM for all levels. Make the training fun (oh, and useful too!). Any training that isn’t required better be overwhelmingly helpful or extremely entertaining — preferably both. With compliance training or required training, we often use tight budgets and accelerated timelines as an excuse to develop less-engaging training. (Not that it is an excuse… It can still be engaging even within these limitations, but that is another blog post.) However, when your audience doesn’t have to take the training, you better pull out all the stops. This can be done affordably and within budget and timeline constraints when thought about strategically and mindfully from the onset. Keep it short. Think about the attention span of your learners. Five minutes may be all you really get; ten minutes if you’re lucky. You might get fifteen minutes if what you offer is extremely beneficial. Keep any non-required training short and in small chunks so learners can fit it into their day. This holds true regardless of the delivery method. Make it easy on management. If you design the training in a way that makes it lucrative to managers (see point 1), they can be your biggest advocates for continuing education for non-required training. The whole process has to be easy and require little effort on their part, however. This includes the delivery of the training itself (where it lives, who delivers it, etc. ), and giving the manager the communication tools that explain the benefits of the training. Most importantly, the training should not take too much time away from the learners’ real job of selling more widgets. These are just a few ideas. What do you do to make non-required training lucrative to learners?